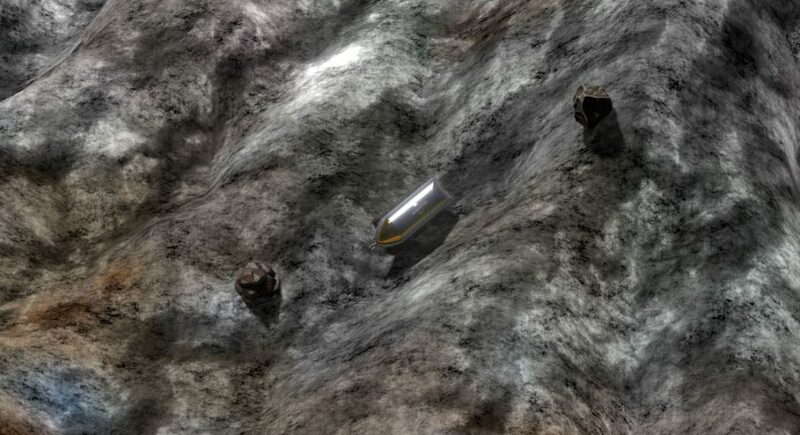 Yesterday I spent some time coming up with the component that populates planets with rocks. Not elements, mind you… that’s next. These are just plain old ordinary rocks that you don’t mine. Why? Because if the planet was populated with just elements, it’d look really weird. So having a blend of ordinary rocks dotting the terrain along with elements you can mine should make things look and feel more natural. Also, the number of rocks present on a planet is proportional to the mineral density reported by the ship scanner. And, they will generally be placed in the higher elevations. I have made it so that you collide with the rocks instead of driving through them. Having the TV drive through 3D objects in the game would just look broken and wrong. The collision behavior works nicely for the most part but will need some fine tuning later to clean up the extreme angle cases. I have discovered another weakness in Unity. Unity takes 4 whole seconds to instantiate the 2500 rocks I am placing on the planet. And that is on my bleeding edge 10 core Alienware PC! That is a ridiculous amount of time. So, real-time instantiation is a major performance issue with Unity and I’m going to have to try and think of alternative solutions. Here is a video showing a nice cruise through the terrain finding and bumping into ordinary non-mineable rocks. Hi, I recently played the (Feb 28th 2019 build), and the first thing I wanted to do was go explore a planet. A little disappointed that the cargo button didn’t do nothing, but I think this might be a place where the remake should deviate from the DOS PC version just a little and maybe take a page from the console version. And a further extension of that would be to “autopilot” to those minerals (eg if the game was played on a tablet.) A SF2 variation would include the lifeforms, but since the lifeforms in SF1 amount to pretty much nothing of value, I’d probably leave it as a manual option, just like artifacts and scanning ruins. Hello – thank you for your comment! The game is still a work in progress – there are still lots to do before the remake is complete. The plan is to remake the game as true to the original game as possible to start with, and then create “mods” to the game that the player can turn on and off for a different experience. The auto-pickup is one of the mods that we have talked about. Autopilot to minerals is a new idea – thank you.